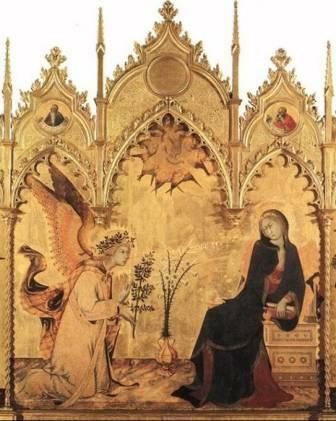 Annunciation. London: Phaidon Press Limited, 2000. Backhouse, Janet. 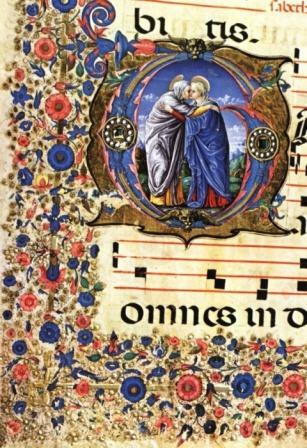 Illumination from Books of Hours. London: The British Library, 2004. Boss, Sarah Jane. Mary: New Century Theology. New York: Continuum. 2003. Bouyer, Louis. The Seat of Wisdom. Chicgo: Henry Regnery Company. 1965. ___________. 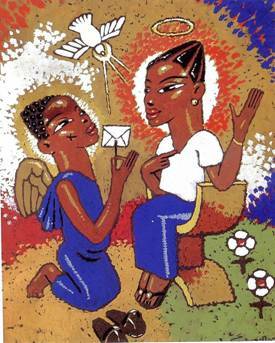 Woman and Man with God. London: Darton, Longman & Todd LTD. 1960. Chung, Hyun Kyung. Struggle to Be the Sun Again: Introducing Asian Women’s Theology. Maryknoll, New York: Oribis, 1994. Cunneen, Sally. In Search of Mary: the Woman and the Symbol. New York: Ballantine Books. 1996. Fay-Sallois, Fanny. A Treasury of Hours: Selections from Illuminated Prayer Books. Los Angeles: The J. Paul Getty Museum, 2005. Johnson, Elizabeth A. Truly Our Sister: A Theology of Mary in the Communion of Saints. New York: Continuum. 2003. Kren, Thomas with Mark Evans. ed.. A Masterpiece Reconstructed the Hours of Louis XII. The J. Paul Getty Museum and the British Library, 2005. Ladis, Andrew. Giotto’s O: Narrative, Figuration, and Pictorial Ingenuity in the Arena Chapel. Pennsylvania, University Park: The Pennsylvania State University Press, 2008. Levine, Amy-Jill with Maria Mayo Robbins. Ed.. A Feminist Companion to Mariology. New York; London: T & T Clark International, A Continuum imprint, 2005. Macquarrie, John. Mary for All Christians. Scotland: T & T Clark LTD. 2001. Norris, Kathleen. Meditations of Mary. New York: Penguin Putnam, 1999. O’Grady, Ron. ed.. Christ for All People: Celebrating a World of Christian Art. Maryknoll: Orbis Books. Panthapallil, Mary. Mary the Type of the Church in the Johannine Writings. India: Oriental Institute of Religious Studies India Publications. 1996. Pelikan, Jaroslav. 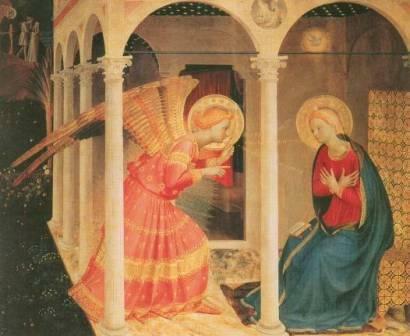 Mary: through the Centuries: Her Place in the History of Culture. New Haven and London: Yale University Press. 1996. Pelikan, Jaroslav, David Flusser, and Justin Lang, O. F. M., Mary: Images of the Mother of Jesus in Jewish and Christian Perspective. Minneapolis: Fortress Press, 2005. Raymond E. Brown, Karl P. Donfried, Joseph A. Fitzmyer, and John Reumann ed. Mary in the New Testament. New York: Paulist Press, 1978. Schottroff, Luise. 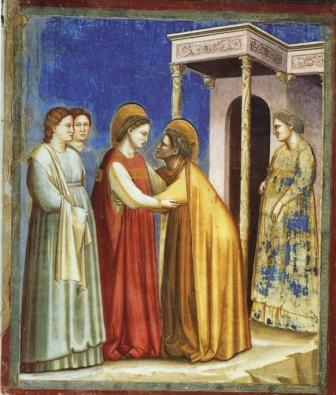 Lydia’s Impatient Sisters: Feminist Social History of Early Christianity. Weems, Renita. Just a Sister Away: A Womanist Vision of Women’s Relationships in the Bible. San Diego, Calif.: Lura Media, 1988. White, John. 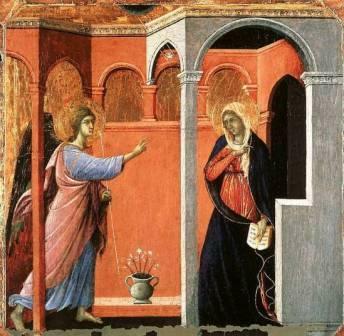 Duccio: Tuscan Art and the Medieval Workshop. The Great Britain: Thames and Hudson, 1979. Bidegain, Ana Maria. “Women and the Theology of Libreration.” Through Her Eyes: Women’s Theology from Latin America. Elsa Tamez. ed. Maryknoll, New York: Orbis, 1989. Saving, Valerie. “The Human Situation: A Feminine View,” Journal of Religion 40(1960), 108-9. 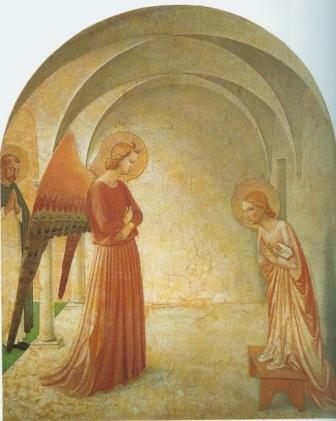 John White, Duccio: Tuscan Art and the Medieval Workshop (The Great Britain: Thames and Hudson, 1979), 17, 118; Annunciation (London: Phaidon Press Limited, 2000), 34-35. 請參閱：Jaroslav Pelikan, Mary: Through the Centuries (New Haven and London: Yale University Press, 1996), 84-5. Ron O’Grady, ed., Christ for All People: Celebrating a World of Christian Art (Maryknoll: Orbis Books, 2001), 36. 請參閱：Valerie Saving, “The Human Situation: A Feminine View,” Journal of Religion, 40(1960), 108-9. Ana Maria Bidegain, “Women and the Theology of Liberation,” Through Her Eyes: Women’s Theology from Latin America, ed. Elsa Tamez (Maryknoll, New York: Orbis, 1989), 34. Chung Hyun Kyung, Struggle to Be the Sun Again: Introducing Asian Women’s Theology (Maryknoll, New York: Oribis, 1994), 78-9. Kathleen Norris, Meditations of Mary (New York: Penguin Putnam, 1999), 32; Johnson, 256-7. Raymond E. Brown, Karl P. Donfried, Joseph A. Fitzmyer, and John Reumann, ed., Mary in the New Testament (New York: Paulist Press, 1978), 121. Andrew Ladis, Giotto’s O: Narrative, Figuration, and Pictorial Ingenuity in the Arena Chapel (Pennsylvania, University Park: The Pennsylvania State University Press, 2008), 19-23. Fanny Fay-Sallois, A Treasury of Hours: Selections from Illuminated Prayer Books (Los Angeles: The J. Paul Getty Museum, 2005), 34-35. Janet Backhouse, Illumination from Books of Hours (London: The British Library, 2004), 64. Jaroslav Pelikan, David Flusser, and Justin Lang, O. F. M., Mary: Images of the Mother of Jesus in Jewish and Christian Perspective (Minneapolis: Fortress Press, 2005), 13, 40. Thomas Kren with Mark Evans, ed., A Masterpiece Reconstructed the Hours of Louis XII (The J. Paul Getty Museum and The British Library, 2005), 32. 請參閱：Jane Schaberg, “Luke”, 284; cited in Johnson, 258-9. 請參閱：John Macquarrie, Mary for All Christians (Michigan, Grand Rapids: William B. Eerdmans Publishing company, 1990), 43-44. Ambrose, De institutione virginis 14.87; in Hugo Rahner, Our Lady and the Church, trans. Sebastian Bullough (New York: Pantheon Books, 1961),9; see also Alois Grillmeier, “Maria Prophetin,” in his Mit ihm und in ihm: Christologische Forschungen und Perspektiven (Freiburg: Herder, 1975), 198-216; and Johnson, 259. Irenaeus, Adv. Haer. 3.10.2-3; cited in Hugo Rahner, Our Lady and the Church, 7-8; see also Johnson, 259. 請參閱：Renita Weems, Just a Sister Away: A Womanist Vision of Women’s Relationships in the Bible (San Diego, Calif.: Lura Media, 1988), 113-25; see also Johnson, 260. Luise Schottroff, Lydia’s Impatient Sisters: Feminist Social History of Early Christianity, 193; see also Johnson, 260. Martin Luther, Commentary on the Magnificat, 19; cited in Johnson, 274. Kwok Pui-lan, “God Weeps with Our Pain, ” in East Asian Journal of Theology 2, no. 2(1984), 228. Virginia Fabella, “A Common Methodology for Diverse Christologies?” in With Passion and Compassion: Third World Women Doing Theology, ed., Virginia Febella and Mercy Amba Oduyoye (Maryknoll, N.Y,: Orbis, 1988), 25. Lee Woo Chung, In Search for Our Foremother’s Spirituality (Seoul, South Korea: Asian Women’s Resource Centre for Culture and Theology, 1994), 32. Kang Nam-Soon, “Creating ‘Dangerous Memory’: Challenges for Asian and Korean Feminist Theology,” in The Ecumenical Review, vol. 47, Issue 1, Jan 1995 (Geneva: WCC), 21-31. 請參閱：Arnold Van Gennep, The Rites of Passage （London: Routledge & Kegan Paul, 1960）; Victor Turner, The Ritual Process (London: Routledge & Kegan Paul, 1969), 95; Victor Turner, Dramas, Fields and Metaphors: Symbolic Action in Human Society (Cornell University Press, 1976), 24. Susan Thistlethwaite, ed., A Just Peace Church (New York: United Church Press, 1986), 35. 請參閱：Amy-Jill Levine with Maria Mayo Robbins, ed., A Feminist Companion to Mariology (New York; London: T & T Clark International, A Continuum imprint, 2005), 126-127. Sr. Elaine MacInnes, “What Is Oriental Spirituality?” in Asia’s Gift to a Total Christian Spirituality, 5. Lee Woo Chung, “Peace, Unification and Women,” in We Dare to Dream: Doing Theology as an Asian Women, ed., Virginia Fabella and Sun Ai Park (Hong Kong: Asian Women’s Center for Culture and Theology, and The EAWOT Women’s Commission in Asia, 1989), 70.